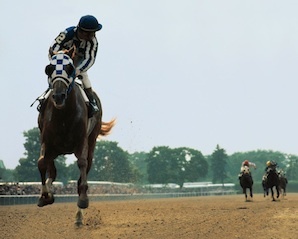 Secretariat raced into the ever glow of immortality in the 1973 Belmont Stakes. His victory, by one of the widest margins in the history of the American turf – 31 lengths ahead of his nearest challenger and in a world record time for the 1 1/2 miles distance – 2 minutes 24, remains one of the most memorable in sports history. At any moment, a racing fan who might have seen a thousand races, or ten thousand races, or just ten races, can think of those winning numbers 31 and 2:24 and be transported instantly back in time. Back to one of the landmark achievements of a sport as old as horse and man. The numbers 31 and 2:24 merely trigger the REAL memory of a horse running as no horse had ever seemed to run before or since.Secretariat ran more powerfully, and with more fluid skill than one could ever hope from a horse. And humans hope for much from horses. To feel the glory of Secretariat’s Belmont is to be flooded with emotion of having seen something of true wonder. The most lasting image, in fact, is probably not in the numbers at all. Those numbers came later, after Secretariat crossed the finish line. Only those who have seen countless races would instantly know what the time on the teletimer meant. 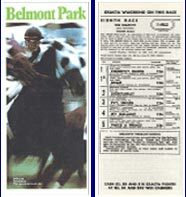 Few of us know the record times for horse races of various distances at different tracks, even though a possible track record was part of the talk leading up to the 1973 Belmont Stakes. For most of us, it took an expert announcer to explain that Secretariat had just run the fastest Belmont in history. 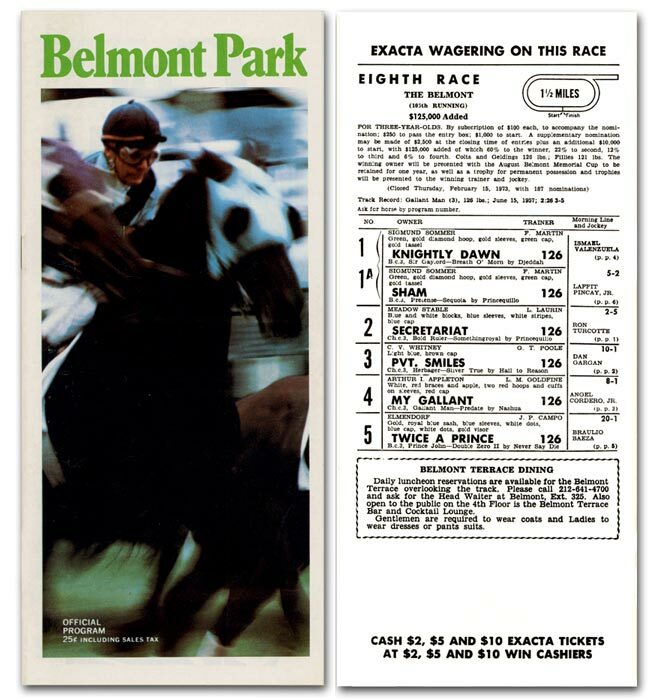 Probably after a moment of research it was noted that the winning time was not merely the fastest 1 ½ miles at Belmont Park, but also the fastest 1½ miles-time ever recorded in America. Maybe even in the world! To figure out that Secretariat’s final margin was 31 lengths is also something that came later. Calling the race on television, Chic Anderson estimated that Secretariat was perhaps 25 lengths ahead. For the official margin, the Daily Racing Form Chart Caller had to study the films, and maybe view a wide-angle (very wide-angle) still photo to count the number of lengths by which the mighty horse won. And what kind of measurement is a length, anyhow? How come they don’t just come right out and say how many feet he was ahead of the second-place horse? Anyhow, the remarkable numbers came later. The true memory of Secretariat in the Belmont is far more compelling than numbers. It is a vivid mental moving picture of a horse doing something no other horse of his time had ever done. Kind of short and sweet. To flesh that out a little, Secretariat broke from the inside post and went to the front from the start. He was challenged by old rival Sham into the first turn, around the long first turn, and into the backstretch. The two were flying on the front end, ripping off quarter-mile fractions of 23 3/5, 46 1/5, and 1:09 4/5 for the first three quarters of a mile. That’s six furlongs, or half the Belmont’s 12-furlong distance, run at blazing fractions. The speed was too much for Sham, but only seemed to energize Secretariat, emboldening him to go on and show what he could do. Sham would fade to last, and Twice a Prince would eventually nip My Gallant for second, in a good performance by those two. As Secretariat rounded the sweeping Belmont far turn (the turns at Belmont are the longest of any track in North America) he seemed to be on cruise control, with jockey Ron Turcotte just steering. Not asking. Secretariat’s lead widened from seven lengths to 20 lengths on that turn. On to the wire, Turcotte did not ease the horse, but let him run on. On any other day, the rider would have been pulling the horse up through the lane, letting him take a bow under wraps. Saving something for another day. But THIS was the day, and the savvy rider knew the horse was running well within himself. Turcotte knew the time had come to let the horse show the world what he could do. By mid-stretch the Big Red Horse was ahead by 28 lengths, with the margin finally to reach 31 lengths by the finish. As he flew down the stretch he stretched out in stride past thousands of wildly cheering fans. Now you saw the jockey. Ron Turcotte wasn’t the kind of rider who moved around a lot in the saddle. He didn’t pump. He was still. Nearly motionless. Like most of the great ones. But maybe you saw him tilt his head just a nod to the left for a moment, in the direction of the infield teletimer. Checking the fractions of the race so far. 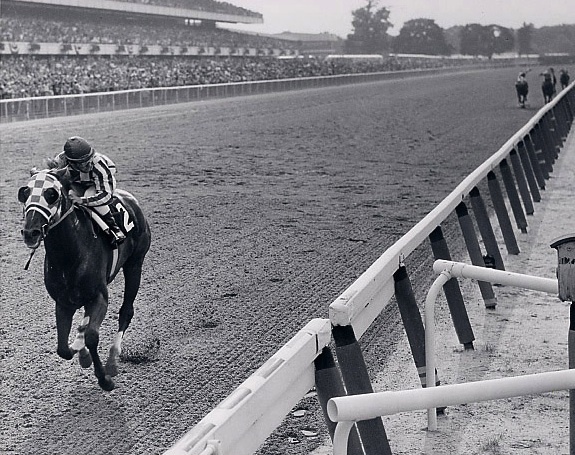 In the Kentucky Derby, Secretariat had broken the track record. He’d broken the Preakness record at Pimlico, too, though the timing was unofficial. Coming to the wire in New York, Turcotte knew with one glance that he had a shot at the Belmont record. If he could get it, that would mean the horse had broken the track record in all three Triple Crown races. An unheard-of feat. In the final strides, we saw the horse for the first time. Before, we had watched the margins between Secretariat and the other horses. Saw how close it was early. Saw how fast they were running. It was the way we watch horse races: watching the way they raced each other, how far one was ahead, whether one seemed to be gaining, or fading. How far. The gap. We saw the closeness melt, and the margin spread like warm maple syrup rolling off the side of a hill of pancakes. But now, instead of the margin we saw The Horse. He was no longer racing the others. He was racing only himself and history. He was gray to us, because we saw him on a black and white TV set. He was solid gray, and the blue and white blocks of the rider’s silks were dark gray and white. The rail was white. The blinkers were checkered. His chest grew. His head held steady. Or lowered a bit, perhaps, as the wire approached. If you were there, at Belmont Park, you saw Secretariat in living color. He was dark red, darker than his normal, bright, reddish-blond coat. With every muscle churning in full combustion, the horse darkened in color. His legs, you couldn’t see them. Not even a blur. You could see his white-stockinged feet. Like a low trail of vapor. A white wisp of flying fog. The moment froze. What we are left with are those fleeting glimpses – a blazing pace, a huge running machine, a visual roar of acceleration, an ever-widening margin, the coat darkening, a white vapor of feet, a jockey sitting chilly, a horse alone – and one long-lasting moment frozen in memory. What we witnessed. The champion’s charisma. A feeling. An emotion. A ripple of goose bumps.